What Happened In 2017: Pedro Baez fell back into inconsistency and then fell off the cliff in September despite a strong start to the season. He’s been one of the most used relievers for the Dodgers in the past two seasons with 138 innings of work, but again couldn’t be trusted in high-leverage situations. Ultimately, Baez did not pitch in the postseason and was left off the NLCS and World Series rosters despite support from Dave Roberts and Kenley Jansen. 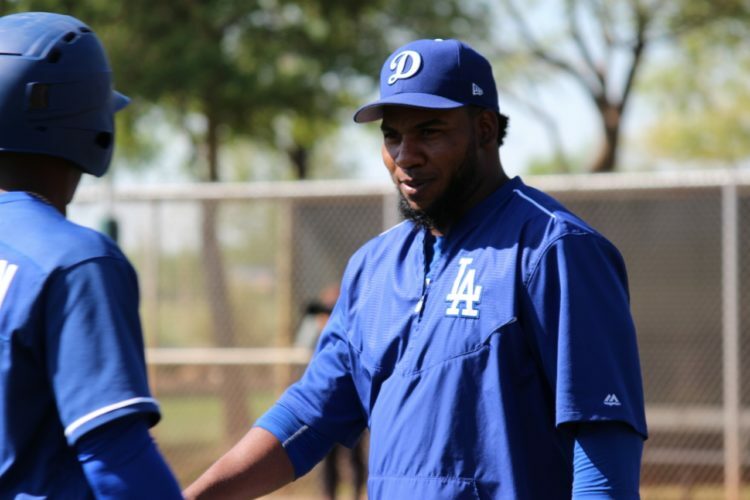 Let’s start off player reviews with a bang and discuss the enigmatic duality of Pedro Baez. He’s a hard-throwing reliever who historically has a deceptively good ERA with high strikeout numbers, but his flaws are shoddy command and slow rhythm. Baez was dominant out of the Dodger bullpen for the first part of the season, and some of his stats are admittedly quite pleasing to the eye. He struck out 38 batters in 37 2/3 innings and held hitters to a .225 batting average, including a .206 clip against left-handed hitters. He also improved when pitching with runners in scoring position. Baez held runners in scoring position to a .099 batting average, third-lowest among MLB relief pitchers. In 2016, hitters slashed .264/.317/.509 against him with seven extra-base hits including three home runs in 53 at-bats with RISP. He also allowed two less home runs than last season. Eight of the nine home runs he allowed this year were with nobody on base, luckily. The bad news is that his strikeout percentage decreased from 28.1 percent to 22.9 percent over a year, and he walked a career-high 10.4 percent of batters. Even though his 2.95 ERA looks solid, he finished with a career-worst 4.44 FIP. The problem with Baez is that the poor outings always eclipse the streaks of effectiveness. At some point you have to accept Baez for Baez. Dustin wrote about his tendency to not be very good in August after he served up a game-winning home run to Tyler Flowers in Atlanta. Things really went sour for Baez in September when hitters OPS’d 1.181 against him, and he started serving up big hits. He allowed eight extra-base hits including three doubles, two triples, three home runs and seven walks in 11 games the last month of the season. This downturn spurred some fans to boo Baez at Dodger Stadium, a response Roberts said pissed him off and was “ridiculous.” Roberts’ faith in Baez was a hot button for fans who were fed up with him during his struggles. Roberts stubbornly continued to pitch Baez, and he did finish the season pitching 4 1/3 scoreless innings of relief with seven strikeouts and no walks. Contrary to the many guesstimates of the Dodgers’ 25-man playoff roster for the NLDS against the Arizona D-backs, plus a horrendous playoff audition in September, Baez made the cut. Roberts did not go to Baez at all in the series, and he was ultimately left off the NLCS and World Series roster. Last year, Baez held opponents to a .150/.292/.400 slash with a 1.62 ERA in 6 1/3 innings in his first six playoff appearances. Then he unraveled in the NLCS, allowing five runs to the Cubs in Game 5. Roberts didn’t give him the opportunity to succeed or fail in the postseason this year, so we will never know if he could have contributed to the Dodger bullpen when they were overworked at times in the playoffs. Interestingly, Baez had similar results in 2016 when he had another one of his productive stretches, a 15-game scoreless streak in July. A reoccurring theme, he never took that step forward to become a viable option as an eighth-inning setup guy to Jansen. Luckily the Dodgers took advantage of a remarkable season from Joe Blanton in 2016 and an impressive year from Brandon Morrow in 2017. A converted third baseman, Baez is 29-years old and won’t be a free agent until 2021. Although he only has 213 major-league innings on his arm, his inconsistency makes him an unreliable late-inning option. 2018 Status: Baez will likely resume a middle-relief role for the Dodgers.